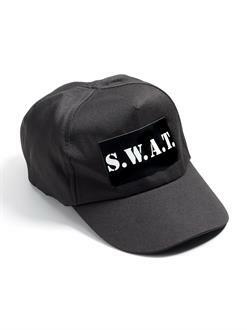 No paramilitary gear gains more respect that the Tactical S.W.A.T. Ball Cap. Well, now you too can be a member of the elite crime-fighting unit of S.W.A.T with this cotton/polyester blend black cap with SWAT logo across the front. Accessorize with an earpiece, gloves, vest, and rifle gun prop.